Five on Friday: Ponchos, Pretty Lights, & a "Dumbphone"
Oh hello there, Friday! I actually felt like this week flew by, which is not always the norm in the crazy world of teaching. Having three days off last week and thus enjoying a five day weekend probably helped the case. But I'm happy to report that the post-Thanksgiving Break blues I expected didn't show up, and it's been a fun week full of lots of celebrations, changes, and anticipation and excitement for the upcoming Christmas season. Here's what the Ks have been up to this week! Poncho Selfies for the Win! Every year for 40 plus years, my dad's side of the family has participated in a family football game on Thanksgiving day. We all trek down to an open area of my grandpa's land that has been specifically reserved for said game. Ever since I can remember, we've rushed the quarterback and caught touchdowns in the trees, all in the name of a little family fun. There've been snowy years and years where we played in shorts. But this year was a little different. Enter the poncho game. The torrential downpour can't keep us down, friends! We may have cut the game short but we still got some plays in, all in the name of tradition and burning off some of that turkey. We also had a great time relaxing with our families, enjoying a meal, and spending the Saturday after Thanksgiving shopping and getting a head start on our Christmas shopping! Aaron was an absolute champ this year and he surprised me by buying all new LED lights and getting them up on our house the Wednesday before Thanksgiving (which turned out to be a fabulous decision because it rained the next three days and got super cold). I love having our lights on to welcome me home from various nights out. Aaron's Grandma took us to breakfast that morning and then proceeded to help me "Christmas-fy" our house all day. 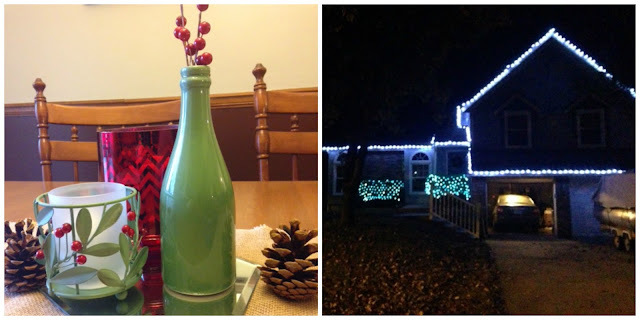 I love love love decorating for Christmas, and I tried a few new things this year. I'm a big believer on not spending much, using what I have, and then purchasing a few small new things each year from Hobby Lobby (on clearance) to round things out. I think I'll have a house tour up soon (along with the new dining room updates!). Thanks, Aaron, for not dying while you crawled up to the top of our roof to hang lights. The things we do for love. If you know me well, you know that I only cut my hair about twice a year. So when I do go get a cut, I want to get my money's worth. I pretty much always cut off four or five inches, get my layers put back in, and that's about it. But this time around, I decided I was ready for something a little different. I wasn't quite gutsy enough to go shorter than my shoulders, but let's just say that I have significantly less hair than I did a few days ago. It feels so much lighter, and I'm loving learning how to style it a little differently. Thankfully, my hair likes to be wavy when drying so I don't have to do much with it if I don't want to. I don't have a picture of me with the new do yet, but this was my photo inspiration (so think this but just a little longer). As you may or may not have seen, I just recently opened up the Moments section of the blog to all interested contributors. 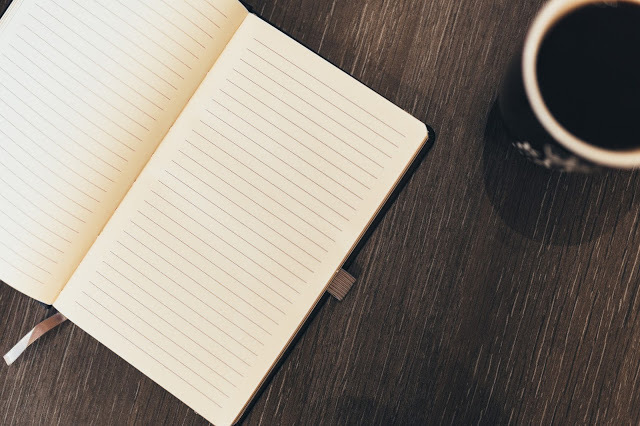 I started dreaming of guest posts last January when the blog started, but wanted to decide a good name for them, if I wanted them on a certain day, and how frequently I wanted them. Aaron helped come up with the name moments, and it started up in July. We've had some really awesome contributors already, but then I sort of got caught up in the crazy world of life and fell off of asking people and giving them actual deadlines. So I've decided to gear up and focus on building that section of the blog a little bit. At the heart of the blog, I'm hoping to provide a place for real, honest conversation- one full of laughter, wisdom, and reflection. In the spirit of this vision, I hope to share not only my own voice and ideas on loving, learning, and living fully, but also the voices of others. If this sounds like something you're interested in, you should check out this contact form and contribute. I can't wait to see what you beautiful people come up with! My smartphone has become more of a "dumb phone" recently, as I removed all forms of social media from it. This change is a result of my desire to slow down, waste less time on social media, and to be more present with those I'm really with (which I shared more about in this post). I still tinker with social media here and there on my laptop, but I have been amazed by the results in only one week. At first it was really weird to not be able to Instagram something fun that was happening (like the Thanksgiving poncho game), or to wake up and have no Facebook to check. But you know what? It has actually been really freeing. I'm taking photos to remember the moment for myself, and not to broadcast it to others (though I do love me some Instagram, and you can totally follow me here- just probably after Christmas ha). I also find myself being more engaged in conversation, being more intentional, and honestly just feeling less stressed and less overwhelmed. Looking a little social media lonely around here. I can't wait to keep you posted on things as the weeks progress! Looks like it's going to be a beautiful weekend here in KC. We've got several fun Christmas events and wedding showers this weekend, along with the time I plan to spend watching Christmas movies and getting some Christmas cards ready. Did I mention I love this time of the year? Happy Friday, folks! Have you liked Currently, Kelsie on Facebook yet? I'd love to have you join our community and get notifications of all the recent posts, silly photos, and posts of other amazing bloggers that inspire me! I'm linking up with A. Liz Adventures, Motivational Monday, Modest Mom Blog, Me, Coffee, and Jesus, What Joy is Mine, The Diary of a Real Housewife, Uniquely Unfolded, Grace and Love Blog, Grace and Truth, Running for Cupcakes, Momfessionals, Life in Leggings, Tell it to Me Tuesday, Bliss and Faith, Sweet Little Ones, Testimony Tuesday, Intentional Tuesday, The Painted Teacup, Twinkly Tuesday, Women with Intention, Messy Marriage, and DIY Just Cuz. I bet your hair looks amazing! I love that style. Your Thanksgiving tradition looks like so much fun. I am so excited that Chistmas cheer is all around us now. Thanks so much, Mikayla! It has definitely been fun around here. Love this time of year! Thanks for stopping by! You may be hearing from me soon. I am looking for places to guest post. As for Thanksgiving and Christmas lights, sounds like a fun game and wish I could see the lights. Now, on the social media -- as a blogger and writer, I understand that we need to use the social media. However, working into your 'work' day and not your home life is important. I visit my networks around 3 times a day. Other than that, I try to ignore it. This does not always works, however. Do you have any advice on balancing work and family life when it comes to social media. I would love to know how you do it. Awesome, Susan! I can't wait to see your idea for a post. I just added a new photo of the lights from the outside (not great quality, but you get the idea) so you can see them! Yes, you are so right- we need to use social media for blogging, but I've found that it was running my day too much. Three times a day is a good plan for you- I found myself checking much more frequently. I think it's all about finding balance. I took mine off my phone because it forced me to have and use my laptop to work on social media. That provided boundaries for me, which has helped. I also know that some people have an app on their phone that limits their allotted "Screen time" on the web- could also be a good option! I love that you called it your "Dumbphone". I definitely need a social media vacation! Haha, thanks Eryn! I has been great for me so far! Oh it was so wonderful! Thanks so much! I think it's been really helpful, and I've also been more lenient with myself lately as far as taking more blogging breaks and not having to have posts every single day. Let me know how it goes, Trish! Have a wonderful weekend! I love that you mentioned taking a break from social media. As a blogger, this is pretty hard to do because you don't want to lose followers or seem MIA with all your social engagement. But sometimes, it's okay to take in those special moments for yourself instead of immediately posting it on Instagram. I tend to take little break from social media (maybe a full weekend off if I can!) and it's always a good feeling. I love the hairstyle you chose! I wish my hair dried wavy--instead it dries poofy. :) Also enjoy Christmas-fying your home!! Thanks so much, Jaycee! I really like it a lot and I've definitely been wearing my hair down a lot more! We had a great time decorating- hope your weekend was wonderful! Love that haircut. I think I'm going to do the same at my next appt in January. It's gotten so long and heavy even though we always thin it out. That Moments section on your blog is such a good idea! Great things all around! I just stopped by your blog from the Peony Project and I am really enjoying your style and genuineness. Keep up the lovely work, friend! Well gosh, Daisy- thanks so very much!! That really means a lot and I appreciate it. I've been having a blast with the blog- thanks for the encouragement and I'm so glad you stopped by! I love that hairdo!!! And I am glad you had an amazing Thanksgiving! Always great seeing family and continuing traditions! I love family traditions! That's just precious and so is your husband. Mine was also on the roof lately, installing security cameras. I had to hide inside... I couldn't handle it. And I can't wait to see the new do! So cool that you're doing that with social media, Kelsie! I've loved the times when I've been disconnected and been able to be more present with the people I'm around, instead of just checking my phone. Blogging makes checking social media a much bigger temptation too! I'm excited to hear how this goes! Thanks, Lauren! It's been really great so far! I'm excited to see how the next few weeks go, and I think there's a good chance I won't be adding most of them back to my phone for quite a while!